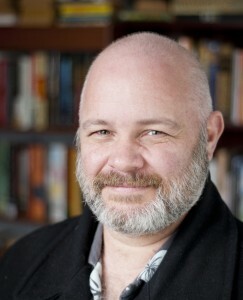 Nathan Ballingrud is an American writer of horror and dark fiction. His first book, the short story collection North American Lake Monsters, was published earlier this year by Small Beer Press. Awards and honors include a Shirley Jackson Award for his story “The Monsters of Heaven,” as well as multiple reprints in Year’s Best anthologies. C. Derick Varn: Most of your stories are set in South with lower middle class and working class characters, most of whom are down on their luck. Why do you see yourself returning, not only to the South as a region, but to that particular demographic of character so often? Nathan Ballingrud: Well, this is the life I know. I was raised in the South, and have lived here just about all my life. I dropped out of college in my junior year, and I’ve made my living in a variety of low-income jobs ever since. So in a very real way, I’m just writing about the world I live in. Also, I don’t see the South often represented in genre fiction, and when it is, it tends to be through a pretty narrow lens. The South is usually defined by its worst examples. There’s a very rich strain of literature focused on this region, exemplified by William Gay, Larry Brown, Dorothy Allison, and others, but aside from a few notable exceptions (I’m thinking specifically of Andy Duncan and Dale Bailey, but there are others), not much of that sensibility crosses over into genre. Everything seems to happen in New England, or the British Isles, or Antarctica. I wanted to see if I could do my small part to bring the South back into the conversation. Steven A. Michalkow: Going off Derick’s initial question, the settings of your stories seem to match your own personal background in significant ways. How much of yourself do you write into your stories? More importantly, do you want us as readers doing the same, namely reading your own person or your own history into these stories? To answer the latter part first, I’d hate for readers to read too much of me in the protagonists. (It’s already happened to some degree, though. There are people who’ve made some comments to me after reading “You Go Where It Takes You” about how much I must hate being a parent, which was hard to hear, and quite off the mark.) For instance, I’d hate to think that anybody would confuse me for the protagonist of “S.S.”. That being said, I do draw from personal experience in a more abstract sense. I take some of my own worst qualities — anger, selfishness, aloofness — and magnify them. I believe self-interrogation is a key to strong fiction. You should write about what you’re ashamed of. You have to be merciless with yourself. That’s related to why I like to write about characters so easy to hate. Writing fiction is, in no small part, about practicing empathy; and if there is a noble purpose in literature, it’s in the fostering of empathy. We live in a tribalistic, reactionary world, and it’s easy to become smug in the little echo-chamber communities we build for ourselves. That’s a dangerous way to live, and I think it’s important to push back against that tendency. S. A. M.: What’s interesting to me about your work is this juxtaposition between the specific and realistic details of your settings and characters with the intrusion of the utterly unreal. I can give answers as to what that produces for me as a reader, but I am curious as to what this juxtaposition means to you as a writer. What compels you to construct your fictional worlds in such terms? Those intrusions inspire behavior which reveal aspects of character. This is true of any traumatic intrusion into the mundane: whether its of violence, fear, or shock. These events can catalyze actions or introspection which might never have occurred otherwise, and can change people’s lives. This is well-known, of course. And using the supernatural as the catalyzing event is just a matter of the genre. I guess the only thing that might be different about these stories — most of them, anyway — is that when writing them, I made a conscious choice to keep the supernatural or fantastical element relegated to the background. I wanted to write about the background characters of what might be considered the “real” story. For example, in “You Go Where It Takes You”, the expected fantasy story would be about the guy with his boxes of skins, and the mysterious figure he believes is chasing him. Toni is just someone he meets along the way. In your typical story, she’s a supporting character. Same with the family in “The Monsters of Heaven”. They’re just people caught up in the wake of whatever global phenomenon is filling the newscasts: dead or dying angels being found everywhere. But these are the people who are most interesting to me. Whatever fantastical element is present in these stories, it’s not a primary focus of their lives. They react to it, or are illuminated by it. And their reactions are what I really care about. C. D. V.: Do you see yourself as having a relationship to the Southern Gothic as a literary tradition? The elephants in the room are always William Faulkner, James Dickey, and Flannery O´Connor. I guess so, if only because I’ve read them and have been moved by their work. But so would any Southern writer working in this mode, about this region. For me, it’s not a conscious thing. I don’t think of the phrase “Southern Gothic,” or even “horror”. They’re just the stories. It’s the atmosphere of my interior life, formed as much by O’Connor and Faulkner as by Robert McCammon and Clive Barker, as by living in New Orleans and Appalachia. It helps, too, that I feel somewhat separated from it all. I was born in Massachusetts to Midwestern parents, so even while living around all the cultural touchstones and mores of the South, they didn’t make it into the home. I’ve always felt like something of an astronaut here. I suspect that sense of strangeness and disconnection has a considerable impact on the way I perceive and write about the South. C.D.V. : Often the monster elements of your stories are inciting incidents or an intrusion to bring out tension in the regular lives of the individuals? Do you see yourself as using the monstrous as a metaphor for elements in the character’s lives? Yeah, I think they’re pretty clearly metaphorical. It’s one of the attractions of the genre for me, and one of the reasons certain of its tropes have such enduring power. The werewolf of “Wild Acre” lets me examine the protagonist’s sense of failed masculinity, the vampire of “Sunbleached” is a great foil to look at the fractured life of a broken family, and the ghost of “The Way Station” is pretty clearly a metaphor for the memory of a city and a life left behind. Everything is a tool to reveal character, and the tools provided by the fantastic or the monstrous are great fun to use. Incidentally, I think that’s the key to reinvigorating worn tropes. People talk a lot about being tired of vampires and werewolves and zombies, but those creatures have endured for as long as they have for a reason. They’re powerful, and they can be used to great effect, depending on what metaphor you apply them to. I’m actually pretty proud of the fact that I have a story for each of them in the book. I like the old monsters. C.D.V. : What writers do you see having the most direct influence on you? It’s a mix of writers working in the genre and realism modes. I got serious about writing when I started burning through the stories and essays of Harlan Ellison, back in college. The furious energy there was invigorating; it was like hooking my brain up to a battery. Stephen King, Peter Straub, and Robert McCammon were huge for me; I read everything they wrote when I was a teenager, and that’s had a defining influence. I drifted away from the fantastic for a while, and that’s when I started reading Hemingway, Richard Ford, and Annie Proulx, all of whom changed what I wanted to do with my own writing in a very profound way. For a long time, I thought was done with fantasy. It just wasn’t providing me with what I was looking for at the time. But I was lured back into the fold by the work of Lucius Shepard and Maureen F. McHugh specifically, both of whom reminded me that there was every bit as much power and beauty here as in any branch of literature. I’m embarrassed that I needed to be reminded of that, but I did. S.A.M: I’ll be the one to re-open a controversy (or non-controversy?) by asking you to go into a bit more detail on how you identify yourself as an author (i.e. a horror writer, a writer of horror, just a writer, etc). The reason I want to explore this topic relates to a number of the things I pick up on in your aesthetics: namely the attention to regionally specific details, the attention to realism, the presence of a specific kind of horror. What does it take to consider yourself a horror writer? Alternatively, if you do see yourself as a horror writer, or a writer of horror, would you ever write something not in that particular genre or mode of expression? I don’t like to identify myself in a particular way. If I sit down and think that I’m going to write a horror story, I find that a certain set of self-imposed constraints fall into place, and my imagination changes course to accommodate those constraints. Others writers may not have that issue, but I do. I want to sit down to a story without that happening. “Wild Acre” was rejected to the first market I sent it to with the observation that it was an “anti-horror story.” I still have no idea what that means. It’s gibberish to me. These words have no clear meaning; they obfuscate more than they illuminate. What’s more, the novel I’m writing takes place on Mars in 1930. It is decidedly not a horror novel. If I went around calling myself a horror writer, I might trick myself into a mindset in which that novel would not have occurred to me, or in which I simply dismissed the idea out of hand. Maybe that’s my weakness; that’s beside the point. I’m not a horror writer, but I do write horror. I write other things too, which will become more apparent in time. These words are just stickers you slap onto a product. They don’t matter to me, and I don’t like to think about them. I get irritable when I do. Other people can worry about the taxonomies of fiction, if they want to. I’d rather just write some stories. C.D.V. : Why do you think the South is represented so poorly in contemporary literature despite a strong literary tradition in American fiction? I don’t know that it’s poorly represented in literature. If anything, it may tend to be romanticized. But Southern literature is currently very robust, and I see no signs of that changing anytime soon. I don’t think you find a lot of it in fantasy or science fiction, but those genres don’t tend to focus on regionalism anyway, so perhaps it’s not fair to fault them for that. You do see a few more examples of it in horror fiction; horror draws a lot of its energy from setting, which leaves it open to regional expression. Steve Rasnic Tem’s recent novel Blood Kin is an example of a Southern horror novel which could not have been set anywhere else. John Mantooth is another writer informed by horror who is writing in the Southern tradition. S.A.M. : You mentioned that you think that for the writer, “self-interrogation is a key to strong fiction,” ant that “you have to be merciless with yourself.” Is there a self-therapeutic role to writing fiction? If so, is that something that the reader could or should pick up on? I guess this raises the question of whether the goal of literature is or should be the same for both the author and the reader. It can be therapeutic for me. Many of the stories in North American Lake Monsters were. I wouldn’t presume to guess how other writers feel about their own process, though. And I don’t think it’s important or even necessary for a reader to pick up on any of that. When I look at one of my own finished stories, half of what I see is actually on the page, and the other half is personal interpretation, or the internal apparatus I brought to the creation of it. The reader will take the outline I’ve provided and fill it in according to the weather of his own heart. I don’t know what that will look like, and it’s none of my business. It would be arrogant of me to want the reader to consider how the story affected me. That’s a distraction from her own experience. So I think the goal of literature is, ultimately, intimate. It’s particular to each individual. It’s a conversation, or an argument, or a fist fight, or a kiss. Whether it’s the same for the author and the reader is unknowable. C.D.V. : Do you think contemporary literary trends have de-emphasized regional writing given the dominance of MFA programs on one end and on NYC’s trends as another? I have to admit that I pay very little attention to this kind of thing. I’m dimly aware of a discussion going on about the conflicting influences of MFA programs and the NY literary establishment, but I don’t know what the details are. I don’t have an MFA degree, and my book came out from a small press, so I have almost no personal experience with either tradition. Living in the South as I do, where writers like Ron Rash, Sena Jeter Naslund, Fred Chappell, Lee Smith, Wilton Barndhardt, and so many others are actively celebrated, perhaps I’m unaware of how regionalism is being diminished or ignored in the country at large. This is one of the many ways in which literature is saved by the small press, though; they get to stay immune to the trends which sway the big NY houses and the universities. The small press is almost always where you find the most exciting work. S.A.M. : What is the allure in focusing your attention around “background characters” or characters which might not typically obtain the focus of our attention in horror literature? Are you interested in these kinds of characters in general, or are they made more intriguing by virtue of being illuminated by the mysterious or monstrous events around their periphery? I’m interested in them in general. They’re the people not included in the history books. They’re the cash register jockeys in the background of the movie, whose faces never come into focus. They’re the people we all see every single day and don’t think about because they’re just there to do their jobs and help the machinery work. Our culture — American culture, in particular — fetishizes the hero. The little guy who overcomes bewildering odds and achieves a mighty deed. It’s a nice story, but it’s just one story, and we’ve heard it over and over again. That experience does not reflect the lives of most people in the world. It certainly doesn’t reflect my own. Most of us fight hard just to stay in place, and lately we can’t even do that. I love that story. I love the story of beautiful failure. Of the frantic struggle not to drown — and sometimes drowning anyway. There’s something desperately sad and desperately lovely in that hopeless fight. At least, I hope there is. Because it’s my fight too. C.D.V. : Do you see working between literary and genre fiction as a way around those trends? First, I have to say that I always object to the distinction between “literary” and “genre.” A certain mode of writing has commandeered the word “literary” to describe itself, and that cheapens the term, because it reduces its scope. It presumes that a work of genre is by necessity distinct from a work with literary ambitions, which is absurd on its face. That being said, I work between the genres of horror and realism, or pulp fantasy and realism, not necessarily as a way around the larger publishing trends, but as a way to incorporate all the things I love as a reader. It’s really just as simple as that. When I become too conscious of trends or expectations, it affects the writing in negative ways. I try very hard to keep it pure, to not think of the current story as anything but the current story. Otherwise I lose the path. S.A.M. : Based on my reading of your work, and from what I have encountered in this interview, I can see that your influences exist as much in the “high” literary tradition as well as the horror and weird genre worlds. Has allowing elements of the supernatural or the speculative into your writing you to better express your more “realist” sensibilities and visa versa? Is there even a tension in combining those two influences? I don’t think there’s much of a tension at all. Horror is perhaps the most versatile genre, in that it can be added into any other genre and give it an entirely new flavor. There’s something deeply true about horror fiction that I respond to viscerally; there’s some nihilistic impulse in me that’s satisfied by its expression. It’s trite to say so, but we really are all going to have to face the long dark at the end. Even the super-heating of the earth is a temporary condition; the coldness of space will eventually settle that score once and for all. This isn’t emotive posturing; this is the height of realism. It’s easy to marry realism and horror because they’re practically the same thing. The trick is to find the beauty in it, and to express that beauty. Horror fiction, to me, isn’t about fear or revulsion. It’s about ache; it’s about terrible sadness. The world is a brutal, pitiless place, and we’re going to lose everything we love, and we’re going to die. That’s the horror. And we’re all aware of it. It’s the effort we make anyway — the struggle for love or beauty or purpose — that I find so sweetly sad. It’s beautiful the way a shooting star is beautiful: it stands in bright, brief contrast to the empty gulf. Every story is a horror story at its heart.